I woke up today and went to Future Shop to buy Stargate: Continuum, although I couldn't actually watch it until after work tonight. It was worth the wait. I admit that I feared Continuum would be a "Well, let's turn 'Moebius' into a movie." Yet another time travel episode. Yes, there were similarities--it's time travel, after all, with alternate timelines and whatnot--but this movie really captures the Stargate genre and provides the essential link between the old Stargate SG-1 series and (hopefully) the future movies to come. Act three of Dr. Horrible's Sing-Along Blog is up. You can watch all three acts until midnight July 20. Go do it. Right now. I've got mixed feelings about act three. As I write this, it's only been up for about an hour and a half, so fan reaction is still formulating. A lot of people are angry. I can see how act three seems like a let down after the first two acts. Now, this may just be major denial on my part, but I think Joss planned it that way. A supervillain musical isn't something you see every day. Instead of casting Dr. Horrible as the straight antagonist and villain, he has made him a villainous protagonist. We actually root for him; we want him to get the girl. But having him succeed in his evil plans and getting the girl would blow our suspension of disbelief out of the water--Penny's character doesn't allow that. So the ending is the only natural way for the plot to conclude (if it is a conclusion). For those of you who haven't watched Buffy, Angel, or Firefly, (I hear you exist, apparently) let me give you a quick rundown on who Joss Whedon is. Those familiar with his oeuvre, please skip to the third paragraph. Joss Whedon is an amazing writer. He is the creator of Buffy: The Vampire Slayer and its spin-off Angel, along with a western science-fiction (yes, it's that cool) series called Firefly. Once upon a time, a big bad network cancelled Firefly after airing 12 of the 14 episodes (out of order), much to the consternation of the fans the show had already acquired. It seemed like there was no hope for resurrecting the series, and an Age of Terrible Darkness ensued. Then, a glimmer of hope: thanks, in part, to fan demands, Universal Studios bought the movie rights to the series, and Joss Whedon made a feature film called Serenity, which may very well be one of the best science fiction films of our time. I wish I knew who did this so I could nominate him or her for a Darwin award. This is what I found when I had to change a light bulb in one of the pot lights above the front desk at work. 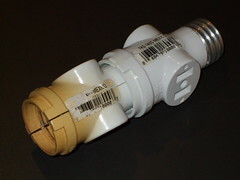 The light bulbs are standard; the fixture is recessed. So someone came up with this brilliant idea to avoid having a recessed bulb. Take a look at the design! It's actually two pieces screwed together. And it's discoloured at the bottom--that can't be good. What's with all the outlets on it? One of my coworkers jokingly suggested it was for plugging in disco balls (the building dates to the seventies). I'm not an electrician (I shudder to think what an electrician would do upon seeing something like this), but that can't be to code. I wonder what will happen if a building inspector ever discovers this. Recently I learned that Yahoo! had raised the price of domain renewal to $34.95/year. :| Considering that the average is usually around $9.95/year (which is what it used to be), and some places are cheaper, this move could seem baffling. Of course, Melbourne IT, the company through which Yahoo! actually registers these domains, charges $35/year. So there may be something going on behind the scenes there ... :ermm: Anyway, regardless of the reason, I am not paying $35 when I can pay $10. So I packed my bags. I have discovered something extremely disturbing today, which I cannot let go unremarked and uncorrected. I have discovered that I don't know the term for a group of groundhogs! Wikipedia has a very nice list of animal names, which includes the collective nouns for each animal. Groundhogs, and even marmots, are noticeably absent from that list. A quick Google search reveals that I'm not the only crazy person out there. Now what do I do if I come across a ___ of mafia groundhogs who attempt to "make me an offer I can't refuse" and barely escape with my life? How am I supposed to recount such a tale if I don't know the correct collective noun to use?! I mean, is it just because groundhogs are largely solitary? But they still live together in burrows. So do we call them "burrow groups"? Families? Or, if you look at the list of animal names, a group of squirrels is called a "dray" or "scurry." Since groundhogs are marmots, and marmots are a type of ground squirrel, do these terms apply to groundhogs? Can you apply hypothetical syllogisms to collective nouns? So far it's the best lead I've got.